In the late Proterozoic, oxygen levels in the oceans increased significantly due to photosynthesis by cyanobacteria. This may have allowed higher metabolic rates leading to the evolution of larger, multi-cellular animals. It may also have allowed marine organisms to form defensive body structures from calcium carbonate, protecting them from early forms of predators. Thus, animals with diverse shells and external skeletons appeared in the fossil record for the first time. 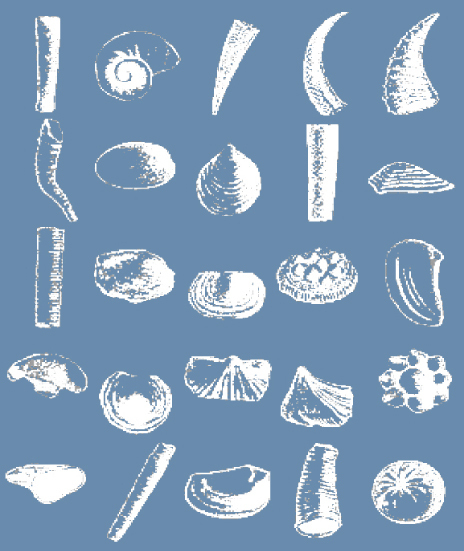 "Small shelly fossils" (SSF) represent the first fossil record of hard-shelled animals and appeared just before the beginning of the Paleozoic Era. They mark a transition from the soft-bodied Proterozoic fauna to the first truly hard-shelled fauna that became more diverse during the beginning of the Paleozoic. They consist of mm-sized plates, cones and tubes made from various minerals, some of which resemble the skeletal parts of modern sponges, brachiopods and molluscs.